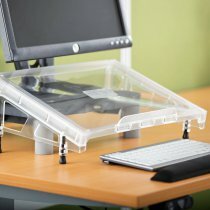 The stable weighted base allows ledge to dip below the desk edge increasing desk space. 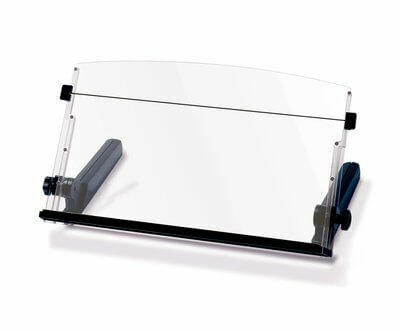 3M InLine Document Holder Large with Elastic Line Guide places documents in-line with your monitor and keyboard reducing movement of eyes, neck and shoulders minimizing strain and increasing comfort. The stable weighted base allows ledge to dip below the desk edge increasing desk space. Elastic line guide marks you place, keeps pages open and stretches to accommodate even the thickest books. 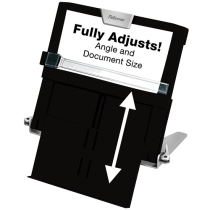 The 18″ wide backplate and 300 sheet capacity supports books, catalogs and just about any size document. Angle and height adjust to suit your needs. Black/clear. 5 year warranty. 40% pre-consumer recycled content. Use of this product helps contribute to LEED® Green Building Certification EB O&M MR Credit 2.2 Sustainable Purchasing: Durable goods because 3M™ Document Holder DH640 contains a minimum of 20% pre-consumer recycled content, exceeding the recycled content required in Credit 2.2.